If you think it’s tricky to make homemade spring rolls, think again. 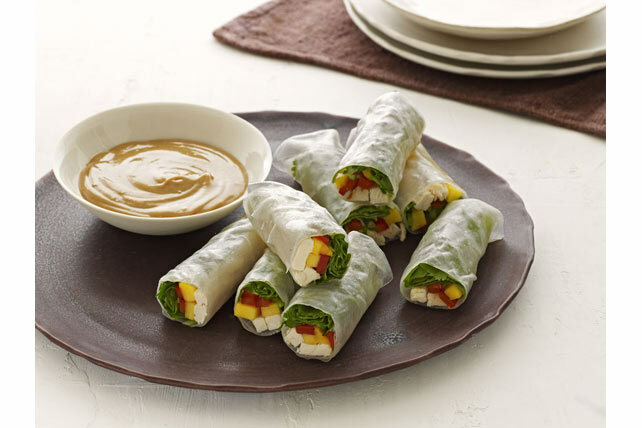 Just follow the simple steps in our Chicken & Mango Spring Rolls recipe and you’ll be munching in no time. Don’t forget the peanut sauce - it’s an essential part of this appetizer recipe! Soak rice paper sheets, 1 at a time, in warm water 1 min. or until softened. Place in single layer on work surface. Place chicken on one short end of each sheet; top with mangos, peppers, onions, cilantro and arugula. Roll up each sheet, starting at topped end and folding in both sides of sheet as you roll it up to enclose filling. Mix remaining ingredients until blended. Serve with spring rolls. Substitute chopped cooked shrimp for the chicken. The red peppers and mangos in these Asian-inspired appetizers team up to provide a good source of vitamin C.